Cortana isn't all about calendar appointments, reminders, and jokes. Cortana is easily one of my favorite features in Windows 10. I use it every day for getting amusing, snarky answers to questions, setting calendar appointments and reminders, sending emails, or doing quick web searches. But those are just its most obvious uses. There are numerous lesser-known ways you can incorporate Microsoft's digital assistant into your life. Here are four useful tips. 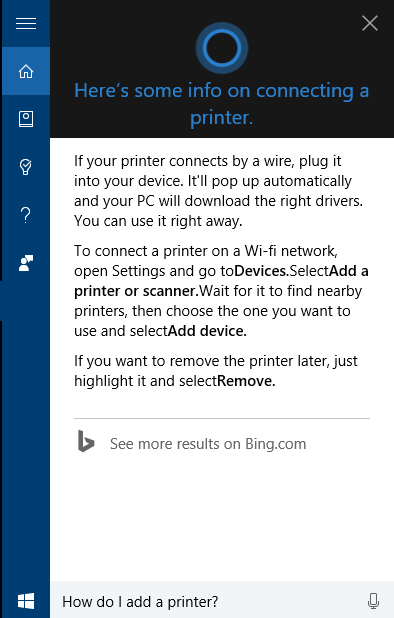 Cortana can help you add a printer. You probably already know you can open regular desktop programs with Cortana, but it can also be used to open key system utilities. Just type Task Manager, Device Manager, or Control Panel into the Cortana search bar and you’ll see an option to open the desired item. Voice commands work as well, but they are a little funky as regards the Device Manager: For some reason Cortana will only give you technical instructions on how to open the Device Manager, and not actually open the utility itself when you ask with your voice. 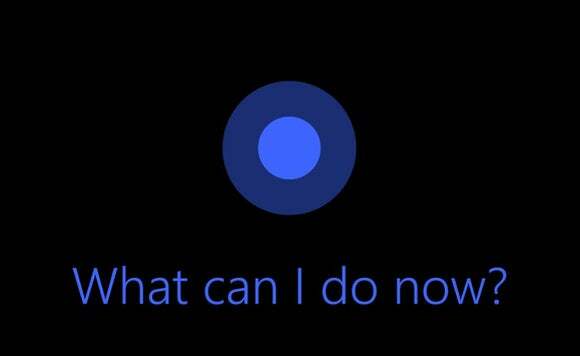 Cortana can also provide technical help from time to time. If you want to know how to adjust Windows-specific settings, like how to change your display resolution, or turn on airplane mode, or add a printer, Cortana can help. Many technical questions you have will be answered with specific instructions displayed on the Cortana pop-up panel, saving you a trip to the Web. You can either type the request or use a voice command, but be careful how you word your question. When I asked Cortana, “How to go into Airplane mode,” the assistant wasn’t much help. As soon as I asked how to “turn on” airplane mode, however, my question was answered. 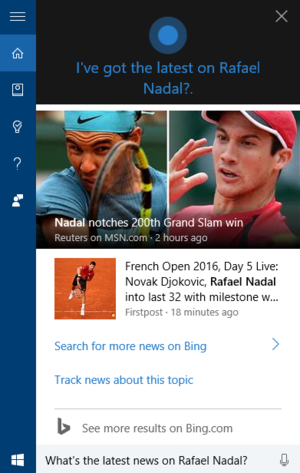 Cortana can read you the latest headlines on demand. This is one of my favorite uses. Cortana already shows you news according to your preferences, but if you want to hear the latest headlines for a specific news topic you can get a quick summary. Just say something like, “Hey Cortana, what’s the latest news on Rafael Nadal,” and a selection of top news headlines will pop up. There will also be a link to read more news on Bing. On top of that, Cortana will read the first headline to you. The most common ways to get Cortana’s attention are to either click on the search entry box or use a voice command. If you already have your hands on the keyboard, however, a shortcut might be the better option. To call up the regular Cortana dashboard with news highlights and weather tap Windows key + S. To open Cortana in a listening state ready to receive voice commands tap on the Windows key + C.